← Phoenix Phabulous History Mural, the next scheduled display location. The first half of this year has been exciting, with plenty of shows and opportunities to explore indigenous art. I’ve been pulling more gallery duty, and painting away when I can. Hence my work weeks have lately been 7 day work weeks, sometimes I’ll take a Sunday, or a Saturday off, but for the most part I’m consistently busy doing projects that keep my life full and happy. With our summer break approaching, and my gallery co-owner away visiting her sister, I decided to make it easy on myself for our May – June show. My history with culture and mythology started at a young age, listening to my elders talking about Coyote stories in the winter, or playing string games with my cousins, the stories were ingrained with the activity and thus, the message was more meaningful to me. Gradually as I grew older, my interest expanded into the current society driven entertainment and the cultural stories ended up being a winter phenomenon. Fast forward to 1995, and I find myself in a small room, lined with books on Navajo mythology, the chantways, different ethnological books related to the Navajo universe. The experience was akin to a tech nerd, taking apart his new purchase, and exploring what “was under the hood,” so to speak. The Coyote stories we had been told were but a small part of the whole saga that is our creation story. From the books, I found references to other cultures around the world and how their stories and myths mirrored ours. These commonalities between people living continents apart always fascinated me, and I started doing more research on why cultures feel the need to have stories that inspire faith, to create a primer on living your life, and to maintain a balance with everything around you. The Hero’s Journey was written by mythologist Joseph Campbell discussing this time honored method of storytelling. A story could have 7 archetypes that would be common. 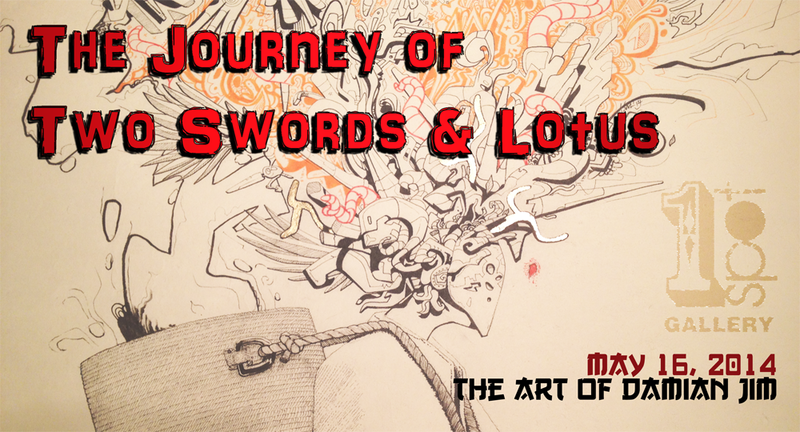 The Journey of Two Swords and Lotus, will explore this theme, with 8 paintings that show a snippet of a pivotal moment from the story. The pieces are all mixed media, with my signature layering style incorporated into the painting process. 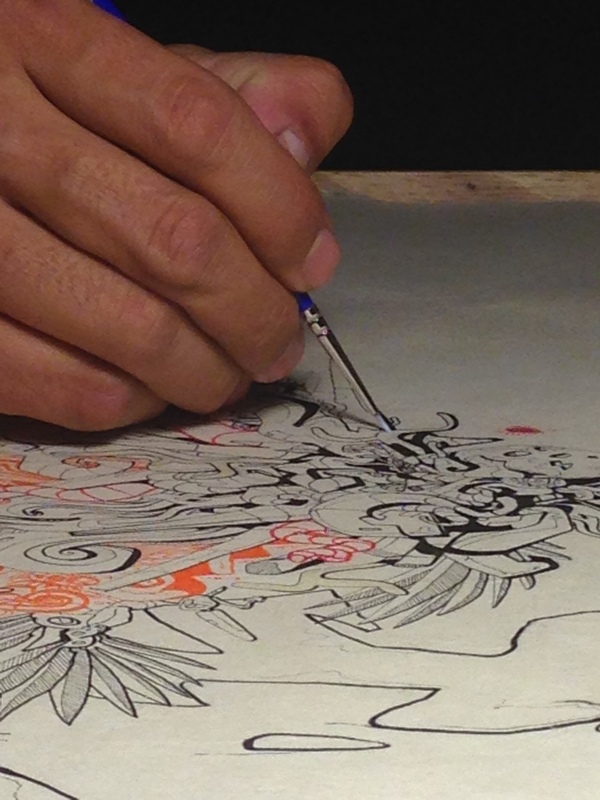 Please join me as we unveil the show this Friday, May 2, at 1Spot Gallery in Downtown Phoenix. The official opening will be on 3rd Friday in May (5/16/2014), we will have the show up for two months. Thank you to everyone for their support and help, especially to Katja Lehmann for the help in organizing and marketing, and I will see you at the gallery!